Recently I took a long break from trading. I decided to have a long holiday and completely forget about markets for months. It let me take a big step back and look at the bigger picture of what I really do and what I believe is important in trading. Coming back to business again I thought it would be useful to summarize my thoughts and give some guide for those who are at the beginning of the long path I’ve gone through. I approached this by describing the stages an average trader including myself would go or have gone through over the years of practicing real trading. At the very beginning we all focus on how to find the best entry points. Once we start practicing with a paper account suddenly we realize that exits are equally important. So we need a trading system. The internet can feed our hunger for very profitable (they claim they are) systems for months or even years, so we can take our time and learn the various ways to approach this problem. This is the first stage what we all have to go through. I say we have to because this is the best way to learn the basics and technicalities of trading. This is what most people bogged down with for a long time and unfortunately some fail to make the next steps. Once we switch to live account and we face the inevitable firs big drawdown caused by a single trade and we feel that little pain in our stomach we realize that we really should focus on risk management otherwise we will blow up our account soon. Then we find out that risk management can be very simple. We just have to size our position based on the risk we are willing to take on a single trade and the stop and entry points. This could be as simple as that. We are all good now, we have nice trading system(s), and we manage our risk and money as professionals do. Unfortunately it is difficult to avoid running into the first discipline related issue (trading for revenge, trying to trade losses back quickly etc. you name it) that results in a big drawdown again. We realize that we are all human beings and not computers that can flawlessly execute any trading plan we program into. So we turn into trading psychology and hopefully spend at least as much time researching it as we've spent searching for the Holy Grail. At the end we realise that it is all about finding the balance between Undercontrol (when we forget about any rules and trade like crazy) and Overcontrol (when we can’t even pull the trigger and make a single trade due to fear from losses). We understand how our subconscious and our rational mind work together and the issues when the subconscious takes over the control, and techniques that help us realizing and avoiding this. At this stage we are almost there. We understand the 3M foundation of trading: Mindset, Money and Method. We also understand that our mental state (Mindset) is probably the most important and without proper risk and money management (Money) we shouldn’t even think about trading systems where entries (Method) become important. Discovering the full complexity of trading we realize that we have to fulfill many roles and responsibilities. In order to be more structured and efficient we have to clearly identify these roles. I use a simple model for this. It is very important to understand that these roles must be fully independent and we can fulfill only one role at a time. So the proper allocation of our time among these roles is vitally important. For example the time spent with research has to be separate from our trading time. Trading is a business that has to be managed properly. We have to create and maintain our own infrastructure (IT, broker accounts, accounting etc.). The manager has to oversight the other roles as well, has to allocate our single human resource among these roles. It has to set goals and time to time analyse the performance. The psychologist is responsible for maintaining our healthy mental state, making sure that our control is properly balanced and dealing with the inevitable emotional problems resulted in by losses, big winners and time to time by frustration. In day trading the risk manager is responsible for position sizing and watching position correlations, which is a no-brainer if we don’t use dynamic discretionary position sizing. The analyst is responsible for understanding the fundamental and technical picture. In my simplified model the analyst determines the direction (long/short/no trade at all) and the type of trade (scalp/trend following) for a particular time-frame (5min/1h/1d etc. chart). The trader is watching the entry conditions that are aligned with the analyst view, executes trades when conditions are met and manages the open positions based on the specific money management method. It is important that when trading we should really forget about analysis, we have to have a very good idea what we are looking for (signals, levels etc.). I found it an eye opener and obviously it is a must in any life endeavor and applies also very well to trading. 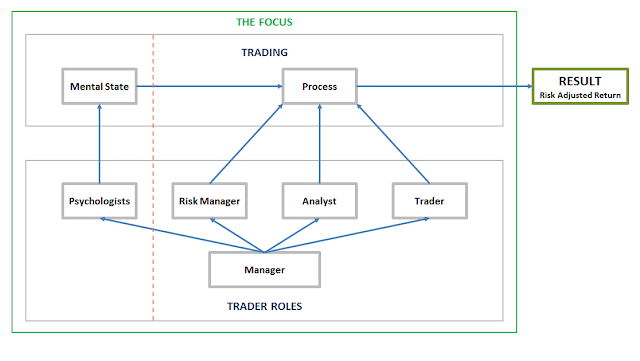 trading process and furthermore, the roles that create that process. For me it was very useful to see this in a structured way. It helped me a great deal in managing my time much more efficiently and in identifying the areas I should develop further. I don’t think reading this would shorten the time for anybody to become a good trader. You have to understand the basics of the market fundamentals, you have to have enough chart-time, you have to go through the emotional roller coaster that takes years and years. But it is always useful to have a roadmap in front of you so you can see where and how you can develop further.